You have many materials and methods to choose from when building a home. We may be biased, but we recommend using timber frames. What exactly are they? Well, timber frames are large wooden beams that form structural support that doesn’t require load-bearing walls. The timbers are precisely joined by connecting a mortise on the end of the timber with a corresponding tenon that fits precisely into place and is secured with a simple wooden peg. This gives timber framing the “old-world” feel many homeowners have come to know and love. Timber framing is one of the oldest known forms of construction, with the first timber frame structure thought to have been built in the tenth century. As the years went on, timber framing found use in institutions like schools and churches, and countless examples are still standing now, hundreds of years later. So, why make the choice to build your home with timber frames? Other than being able to create your own custom build, constructing with timber frames offers an eco-friendly building option for your home. Timber framing uses green building material, because trees are considered a renewable resource. At Mid-Atlantic Timberframes, we make sure our timbers come from well-managed forests, and our suppliers plant as many as ten times the number of trees they cut down. We make a conscious effort to keep waste to a minimum during every stage of the process, from the moment the timber frames arrive at our facility, up until they are delivered to the build site. But back to that custom build idea. Building a home with timber frames allows for vast design flexibility, so your home can truly reflect your own personal taste. The use of large natural timbers does add to the cost, so a timber frame home is typically more expensive than a traditional stick built home, but the strength, warmth, and beauty of natural wood make a statement that other homes just can’t match. When you’re ready to start looking for a build partner to make your timber frame home plans a reality, make sure they understand what you’re looking for. 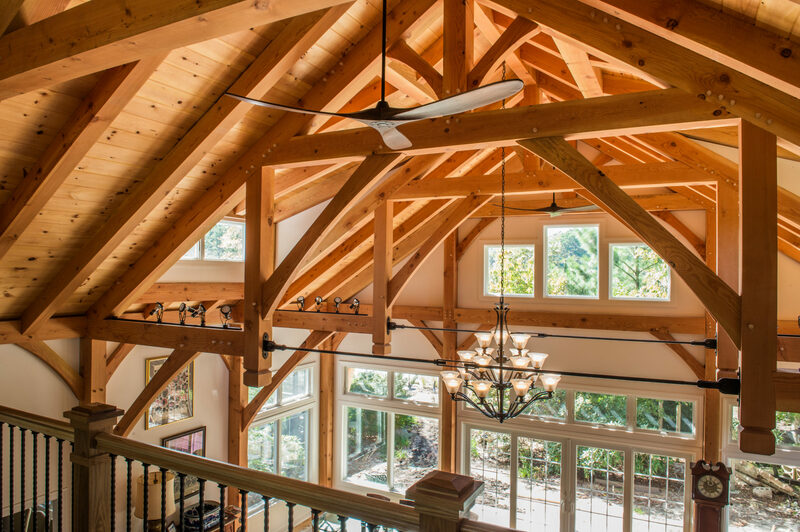 Our team at Mid-Atlantic Timberframes will treat your timber frame home dreams just as they should be—a dream come true. Contact our team of designers and learn how to get started with your own custom timber framing.